For the next week there is 20% off the entire Loud Ninja Games 15mm range at Alternative Armies. This event gives you not only the change to expand your forces of the Yandrassi, the Ikwen, Wasteland Mutants and more it also means the chance to tell us what you think should be next for the range. Eli Arndt and I both want to know your thoughts. See the article for more information. The discount is on screen and ends 9am GMT 11th February 2019. You can get that Archon Mecha you always wanted too. If you want to make a suggestion then contact us or note it here. This entry was posted on Monday, February 4th, 2019 at 08:24 and is filed under News. You can follow any responses to this entry through the RSS 2.0 feed. You can skip to the end and leave a response. Pinging is currently not allowed. That mech definitely got my attention. Thanks chaps. Kind words. 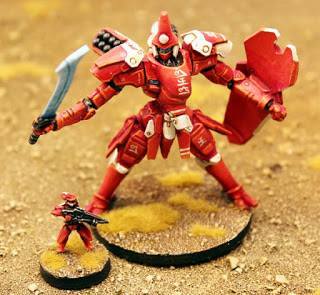 You use the Archon in 3mm scale! Truly massive! At 3mm scale they don’t mess around.